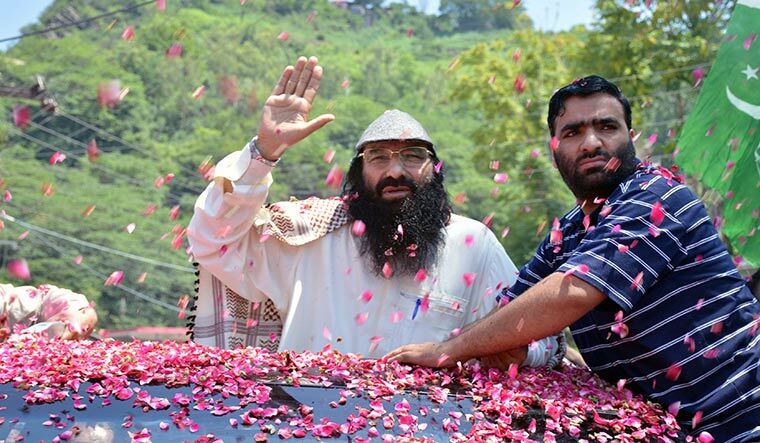 Peer Muhammad Yousuf Shah alias Syed Salahuddin is the supreme commander of Kashmir’s largest militant group, the Hizbul Mujahideen. He is also the chairman of United Jihad Council, a coalition of militant groups fighting in Kashmir. Last year, the United States named him a specially designated global terrorist. In an exclusive interview with THE WEEK, the 72-year-old militant commander spoke at length about the American move, on the conflict in Kashmir and the prospects for peace. The United States has declared you a global terrorist. It will not change the disputed status of Kashmir. This declaration is to appease India. It has not come as a surprise to us, nor will it render illegal the just struggle in Kashmir. Alongside the political and diplomatic fronts, Kashmiris continue to wage a struggle on the military front, for their right of self-determination under UN resolutions. However, the use of force against innocent civilians, women, and children is prohibited in our religion. The steps announced by America have not and will not have any impact on us. Azad Kashmir (Pakistan-occupied Kashmir), politically and morally, has the status of a base camp for us. Since the territory is under Pakistan’s control and Pakistan being a key party to the dispute, it continues to support us politically and diplomatically. Some analysts say your designation as a global terrorist will give a boost to Islamic State and Al Qaeda sympathisers in Kashmir. That is not right. Daesh (Islamic State) and Al Qaeda have almost no presence in Kashmir. However, some Indian agencies are trying to use some unsuspecting youngsters to create a situation for civil war in Kashmir, which did not and will not succeed. Is there pressure from the Pakistani government or military to stop your activities in Pakistan, after the US move? There is no pressure. In fact, we are working in a far more peaceful and favourable atmosphere than before. Since most of our activities pertain to India-occupied Kashmir, we are conscious of not violating Pakistani laws. There is growing clamour within Pakistan to stop supporting militant groups operating out of the country. We don’t see anything of that sort happening in Pakistan, especially against groups operating in Kashmir. There are, however, some reservations against groups whose leadership is in the hands of some outsiders. We would welcome anyone from anywhere, who is ready to support the mujahideen in Kashmir against Indian forces. They are like our respected guests, but they would have to work under the command of local mujahideen and act according to their policies and tactics. The Hizbul Mujahideen has ceased to be a dominant force in Kashmir. The Hizbul Mujahideen, by the grace of God, is still very strong and no less powerful than other groups. There is no difference in its performance. However, methods and tactics have changed according to the necessity and the situation. Sometimes, actions are carried out in collaboration with other groups, without us claiming responsibility. How long do you think the armed struggle will continue in Kashmir? It will go on till India stops calling Jammu and Kashmir its integral part, accepts the disputed status of the state, is ready to implement the UN resolutions on Kashmir and takes serious steps to resolve the issue. Have you ever contemplated pursuing a political path? If there was a possibility of resolving the Kashmir issue politically, there was no harm going down that road. India has never been serious and sincere in resolving the issue. In the last 70 years, there were a number of opportunities, but India didn’t desist from its recalcitrant stand. We don’t cherish militancy. It has become a compulsion for us because of India’s obstinacy. What is happening to the people who are fighting politically? They are being arrested, detained, tortured and implicated in false cases. There is a ban on peaceful assembly of people. Even the ban on Friday prayers has become routine. What are your impressions about the slain commander Burhan Wani, who is being credited with breathing new life into the separatist movement? About Shaheed Burhan Wani, I can only say that movements based on truth do suffer such setbacks. But, they do not end. Nor can their way be blocked. Credit goes to Burhan for using social media to create enthusiasm and passion among the youth for jihad, and for infusing new life in the freedom movement by his martyrdom. The Army says it has broken the back of militancy in Kashmir by killing nearly 300 militants, including senior commanders of the Hizb, since January last year. This is an illusion. Pumping more troops in Kashmir, oppressing people, destroying homes and dishonouring women are clear proof of the frustration of Indian troops. Martyrdom is part of military struggle, which can be minimised by better strategy, but cannot be stopped completely. Isn’t the Hizb suffering from a serious leadership crisis after the killing of senior commanders like Burhan and Sabzar Ahmad Bhat? There is no such thing. The young volunteers and those who are fighting this war possess great leadership capabilities. The Joint Resistance Leadership of Syed Ali Shah Geelani, Mirwaiz Umar Farooq and Yasin Malik is being criticised for its hartal politics during the 2016 uprising. Many accuse these leaders of mismanagement. Resistance leaders (separatists) can better answer this question. However, hartals seem to be the only democratic option left to register protests due to the ban on the meetings of leaders, protests, detentions and harassment of leaders by implicating them in false cases. Disenchantment is growing about how teenaged boys are recruited by the Hizb, and the way in which commanders are exposing themselves on social media. Are these instructions coming from you notwithstanding the risks? We cannot discourage someone’s passion and sincerity. We try our best not to recruit those who are very young. Mental maturity and physical toughness is a must. These guidelines have been passed on to the commanders on the field. What do you have to say about Zakir Musa, who quit the Hizb and joined an Al Qaeda affiliated group? He has threatened to kill Hurriyat leaders and called Pakistan an apostate state? About Zakir Musa, I can only say that Indian agencies have used him by taking advantage of his innocence, immaturity and emotions. I still hope that he will understand the conspiracy against his freedom-loving nation and do a favour to the oppressed people by coming back. What is the United Jihad Council’s connection with Lashkar-e-Taiba and Hafiz Saeed? The relationship between local militants and foreign militants is that of the Muhajireen [first Muslims who migrated to Medina from Mecca] and the Ansar [first Muslims of Medina]. The status of foreign militants in Kashmir is that of a helper and not of a master. Union Home Minister Rajnath Singh has been talking about a permanent solution to the Kashmir problem. The solution according to India’s home minister is to create a graveyard like silence in Kashmir through the use of repressive methods. He wants to suppress all voices of resistance to create artificial peace, to tell the world that Kashmir is a problem of law and order, so that Kashmiris never get their legitimate right. You have been out of Kashmir since 1993. Do you miss home, family, and friends? I am a human being, after all. I also feel sadness and happiness. I grieve over losses and long to meet loved ones. But, these small sacrifices are not important in achieving the greater goal. Will you travel to Srinagar or Delhi for talks? I would seek every legitimate step for a sustainable solution of the Kashmir issue.